This is the best small four-door hatchback for you if you can compromise to make a fashion statement. Introduced for model-year 2018, the C-HR (Coupe-High Roof) is tough to classify. Its wagon-like body and raised suspension are characteristics of a subcompact crossover SUV. But the traction-enhancing all-wheel drive (AWD) that’s also a crossover characteristic is unavailable. The C-HR is front-wheel-drive only, like a subcompact car. Still, it’s priced and marketed against subcompact crossovers such as the Subaru Crosstrek, Jeep Renegade, and Chevrolet Trax, so we’ll treat it as such. 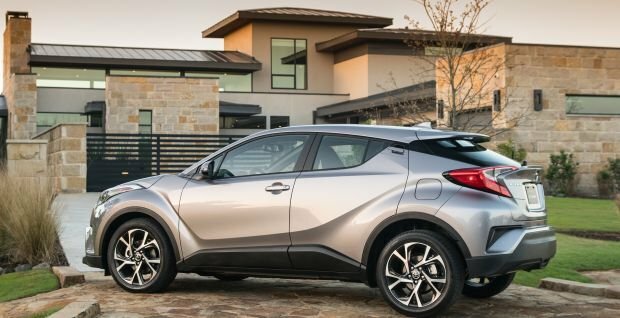 The C-HR is Toyota’s first entry America’s fastest-growing automotive segment, with sales up an astounding 39 percent through April 2018. C-HR sales are growing, but it still trails the aforementioned rivals, as well as the Honda HR-V. Absence of AWD may be part of its challenge, but its wacky styling surely gives some shoppers pause. Indeed, the C-HR was intended originally as a wild-looking vehicle for Toyota’s youth-oriented Scion division. When the automaker shut down Scion after model-year 2017, the C-HR was inherited by the parent brand. And for model-year ’19, a version of the C-HR’s understructure migrates to Toyota’s premium Lexus division, where it underpins the all-new UX premium subcompact crossover. Costlier and more luxurious than the C-HR, the UX is available with AWD but hardly looks less polarizing. Wait. While sophomore-season C-HR isn’t in line for styling updates, a Toyota executive tells us the 2019 model will receive Apple CarPlay compatibility. Support for Google’s Android Auto was not confirmed, though, we suspect it’ll be part of the picture. It’s overdue but applaud Toyota for making the move. Its proprietary Entune infotainment system is functional but feels outdated compared with more modern setups, such as Chrysler’s Uconnect or Hyundai’s BlueLink, both of which also support Apple’s and Google’s smartphone interfaces. 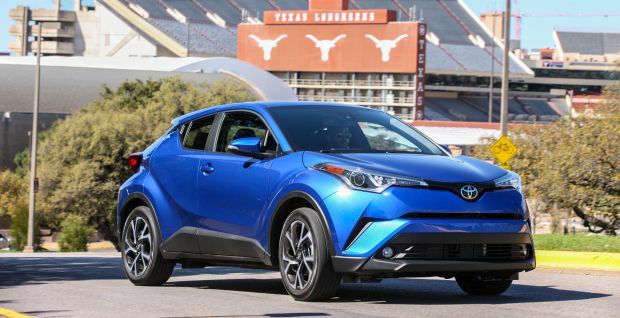 There’s a possibility of a powertrain addition, too, with Toyota introducing a C-HR hybrid model. The UX250h is available as a gas-electric hybrid that achieves AWD by using an electric motor to power the rear wheels. Whether a hybrid C-HR would follow suit only Toyota knows. Its other crossovers, the compact RAV4 and midsize Highlander, are also available as AWD hybrids. If the automaker believes C-HR sales would benefit by a lower price of entry to the lineup it could introduce a new model for ’19. As an answer to the less expensive Nissan Kicks (a rival that’s also front-wheel-drive only) this new entry-level C-HR would likely be called the LE. It’d slot below 2018’s price leader, the XLE, and join the returning XLE Premium as the third C-HR trim level. Styling: C-HR follows a “form over function” mantra. That leads to compromises we encourage you to thoroughly investigate if you’re considering this little crossover. We do give Toyota props for taking a styling risk here. The grille bears a familial resemblance to some of its other vehicles, but from the front roof pillar rearward the C-HR is unique. One compromise of the styling involves the rear door handles. They’re mounted close to the roof to achieve a coupe-like appearance, but the effect contributes to gigantic blind spots because the rear pillars are so thick. The shortfall is mitigated some by blind-spot and rear cross-traffic detection, but the safety feature is limited to the XLE Premium, where it’s standard. Toyota needs to include it on every C-HR. The interior does a better job combining design and purpose. An embossed raindrop pattern on the headliner and a dark checkerboard pattern on the door panels lend visual interest. The padded dashtop adds a dash of class. Instrumentation is standard Toyota fare, with clear main gauges bookending a color LCD screen. The standard Entune infotainment system is fine, but again, we’d wait for the 2019 model because it will support Apple CarPlay. A rearview camera is standard, but rather than displaying on the dashboard’s central infotainment screen it uses a portion of the inside rearview mirror. The picture is clear, but the image is very small. Given the huge rear blind spots, you need to be extra careful when backing up. Passenger room and comfort are about average for a subcompact crossover. Front seaters fare well; the rear is tight for both headroom and legroom but not egregiously so. Cargo volume is a class-competitive 19.0 cubic feet behind the rear seatbacks and 36.4 with them folded. The front center console is tiny and the forward-most cupholder is located inconveniently under the climate control pod, making it awkward for taller beverages. We appreciate the cupholders built into the rear door handles. Mechanical: There’s but one engine, a 2.0-liter four-cylinder engine with 144 horsepower and 139 pound-feet of torque. That’s midpack for the class, but it’s saddled with a less-than-snappy continuously variable automatic transmission (CVT) and a heavier-than-average 3,300-pound curb weight. Off the line, the C-HR takes a car length or two to really get moving, and the engine runs out of steam quickly. Highway passing and merging require lots of advance planning. And when you undertake these maneuvers, prepare for your ears to be assaulted by the droning engine. Much better is the C-HR’s balance of handling and ride. 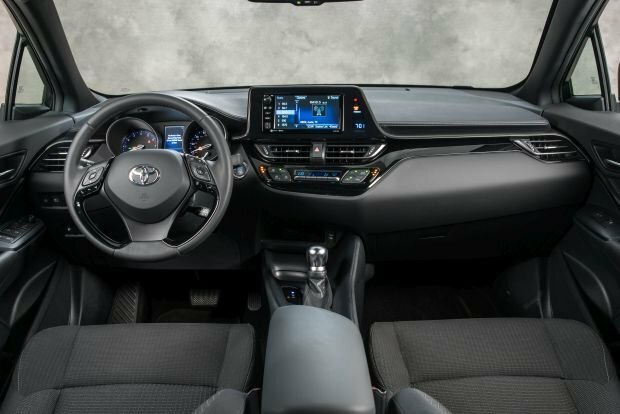 Steering feel is very direct and the crossover holds the road and changes direction with greater balance than you might expect from a Toyota, especially one that’s front-drive only. A tidy turning radius eases parking worries. The ride is very stable. Really large bumps can send shudders through the body structure, but they’re never severe enough to degrade driver confidence. The only wheels are 18-inch alloys shod with tires that have plenty of sidewall, so most pavement imperfections are easily absorbed. Features: Standard equipment includes niceties such as LED daytime running lights, dual-zone automatic climate control, and a 7-inch dashboard infotainment screen. More important, it also includes Toyota Safety Sense P (TSS-P) driver assists highlighted by autonomous emergency braking that can stop the C-HR to avoid a frontal collision with another vehicle, object, or pedestrian. Lane-departure warning with automatic steering correction is another notable standard at this price level, as are automatic highbeam headlights and adaptive cruise control that can maintain a set following distance from traffic ahead. The XLE Premium adds to the XLE fog lights, keyless access with pushbutton ignition, sport bucket front seats and the blind-spot alert with rear cross-traffic detection. Including Toyota’s $995 destination fee, the 2018 C-HR XLE has a base price of $23,495 and the XLE Premium starts at $25,345. The only factory extra is R-Code paint, which includes a unique body color paired with a white roof. It’s a neat touch, and again, we applaud Toyota for daring something different. This option costs $500-$895 depending on which color you select. With its standard blind-spot alert and keyless ignition, our best-value pick is the XLE Premium. EPA fuel-economy ratings for this small crossover are a middling 27/31/29 mpg city/highway/combined. Our real-world testing proved it’s capable of much better. Over the course of more than 1,000 highway miles, our XLE returned an impressive 34.3 mpg. C-HR uses regular-grade 87-octane gasoline. A previously mentioned, support for Apple CarPlay is the biggest change coming for the 2019 C-HR. This is a step in the right direction for Toyota, and we hope such compatibility will be made available to owners of the 2018 model in the form of a software update. Everything else that might be coming for the C-HR is a rumor at this point. Should nothing else come to pass, expect little in the way of substantive changes until its mid-lifecycle refresh, which is on tap for either model-year 2020 or 2021.